Welcome to The Abso!ute Sound online! We explore music and the reproduction of music in the home. We believe that the sound of music, unamplified, occurring in a real space is a philosophic absolute against which we may judge the performance of devices designed to reproduce music. Our goal is to provide the resources consumers need to judge how a component's sound either honors or departs from the music's truth, and to make sound purchasing decisions that maximize their experience of reproduced sound. Below is our Issue 155, August / September 2005 table of contents and editorial. Chris Martens finds this French system a winner for both music and film playback. A new column from Wayne Garcia debuts with the Sutherland Director linestage, and line and phono preamps from Artemis Labs. 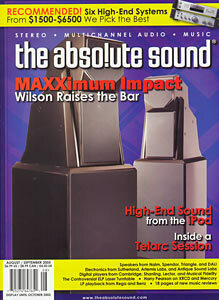 Robert Harley on the latest evolution of Wilson Audio's designs. Chris Martens configures six budget systems between $1500 and $6500 that deliver real musicality at down-to-earth prices. Is the iPod for audiophiles, or is it the downfall of Western civilization? Robert Harley explores how to achieve the most from Apple's ubiquitous music machine. Chris Martens listens to the Benz Micro ACE-L, while Jim Hannon takes his turn with Rega's P5 turntable, Exact cartridge, and TT PSU power supply. This inexpensive machine provides fine performance and value, says Jim Hannon. Barry Willis reports on three pieces of tube gear, priced for the workingman. The BBC tradition lives on but with a new twist, says our Sallie Reynolds. Jeff Dorgay on a lithe and satisfying performer from England. Sallie Reynolds on two outstanding but different-sounding CD players. Neil Gader listens to the speaker, while Robert Harley guides the tour. An excellent-sounding (if slightly romantic) CD player, says Wayne Garcia. Jonathan Valin has mixed feelings about reading his grooves with light. The Decca London XRCDs: End of the Line; Mercury Living Presence and the Super CD List; The Sonic Rewards of CD Nurturing. Andrew Quint reports on how the label avoided a near-disaster with a recent project. Reviews of 16 new CDs and five LPs, including the latest from Ry Cooder, Bruce Springsteen, Common, Billy Corgan, System of a Down, Weezer, and Lucinda Williams. No fewer than seven CDs and one LP critiqued, including full-lengths by Keith Jarrett, Tord Gustavsen, Marian McPartland, Joshua Redman, Kenny Wheeler, and Hugh Masekela. Twelve discs and one LP box set reviewed, featuring the first Bach releases from John Eliot Gardiner's new SDG label, two JVC XRCDs, and the latest Mercury Living Presence SACDs. Gader, Garcia, Harley, and Valin tell you about a few records you might hear, should you be invited into their listening rooms.